"What do you do about students who don't want to write?" This time, the question came at a session where we were moderating writing samples, sharing a process designed to create a continuum. It is a question that comes up almost every time I talk with teachers about writing. It is a question that crosses grade levels and gives pause to both beginning teachers and their more experienced colleagues. It is a question that can be phrased in many ways...but essentially asks the same thing. "How do you handle it when kids just don't write?" A big part of my response falls under the category of describing quality. When students are shown what quality can look like, some of that reluctance disappears. 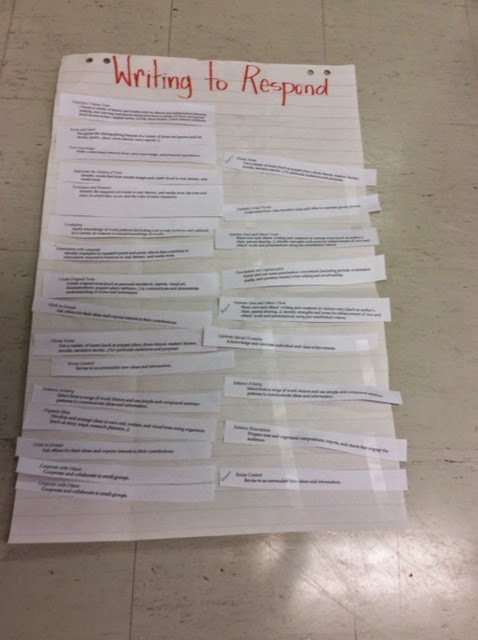 Using the gradual release of responsibility (Pearson & Gallagher, 1983), writing moves from ME (the teacher) to WE (shared responsibility) to YOU (the student writing independently). I use two very powerful strategies for showing my students what writers do. Teachers have always modelled. It was part of my repertoire as a beginning teacher and it is today. Changes have occurred over the years for me, some subtle and some less so, as I have refined my practice and reframed my thinking about what I am doing and why. Today, when I model writing, I choose to do so when we are learning a new genre or format, when I need to show students how a writer works, why a writer does something like revising, or what good writing looks like and sounds like. In the past, I sometimes modelled because it was a step in the gradual release. I modelled because it was part of good teaching, because valued colleagues modelled, because I was a Grade 1 teacher... I modelled for many reasons that on their own, were not as authentic or intentional as they could have been. Now, I model for very particular, and more considered, purposes with a very specific audience in mind. And my models are stronger because of it. 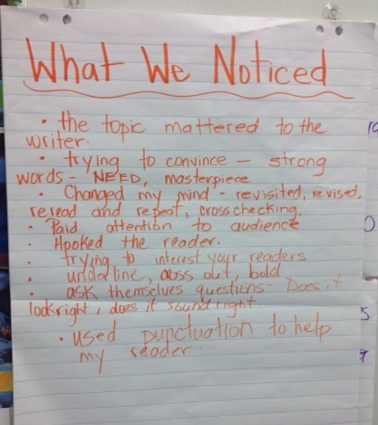 We know that student writers improve when they write for authentic purposes and audiences (Routman, 2005). This is also true for teacher-writers. When I take the stance that I am modelling to show students what quality looks like, I see those models or demonstrations in a different way. I know they cannot be perfunctory...or the writing that follows will be perfunctory. I know they cannot be incomplete...or the writing that follows will be incomplete. I know they cannot be shallow and impersonal...or the writing that follows will be shallow and impersonal. What you model is what you get. What I understand now is that this applies not only to the writing itself, but also to topic selection, the commitment you feel toward the writing and your readers, and your attitude toward writing. To inspire students to write, I need to find topics and formats that we can care about. 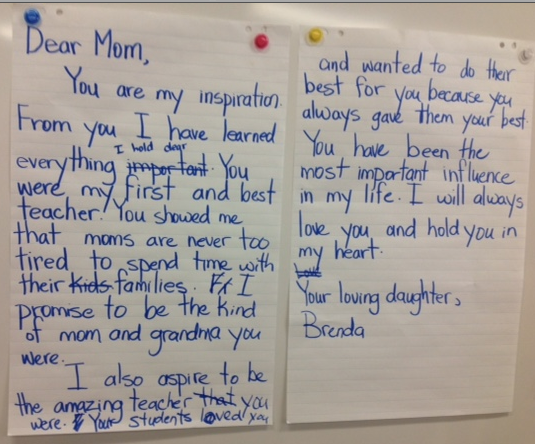 We, because when I, the teacher, can write from my heart, the models ring true. Great writing topics, those that have a purpose and audience worth investing in, appeal to the teacher and the students, including the reluctant writers. To hook those reluctant writer, I must be "really writing" as I write in front of them. So, as we begin writing letters to someone who has been a big influence in our lives, I write to my mom. 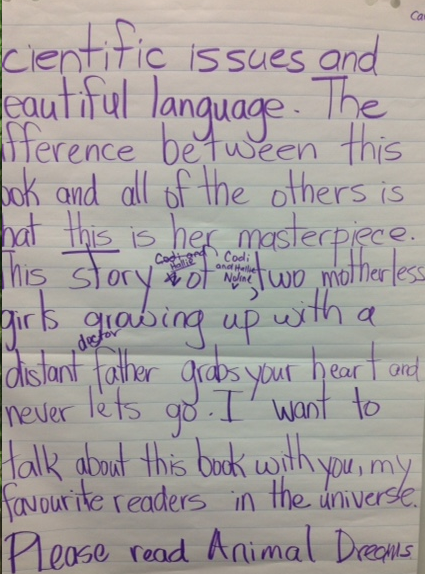 With a Grade 3 class beginning to write book reviews, I write about a book in my own reading life that I want my book club to read because it will be more real for me, and therefore, for my students. As teachers have always done, as I model, I talk. This talk shows the student writers the kind of thinking that a much more experienced writer does, a running commentary that adds to the description of quality. To make this description even more explicit and more beneficial to the reluctant or struggling writers, I ask students to tell me what they noticed me do. This list informs the criteria we co-construct later - yet another way to describe quality. Another time-honoured strategy, shared writing, has remained part of my practice over many years. 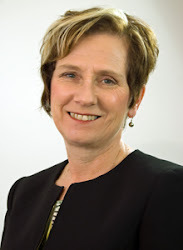 It is an incredibly powerful way to release some of the responsibility to the students, to engage them in writing with you while maintaining control over the picture of quality writing being presented. Viewing shared writing as another means of offering a picture of quality, I find I am able to make decisions in the moment about what to include, what to leave out, when to write a sentence myself, and what questions and comments to make. My purpose is no longer muddled. 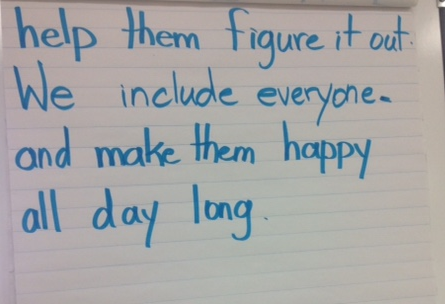 In this 'shared write' with a Grade 1 class, we were all going to be writing about something we are experts at. Our audience was other students in the school, and ourselves, as the plan was to produce a book for our classroom library and the school library. 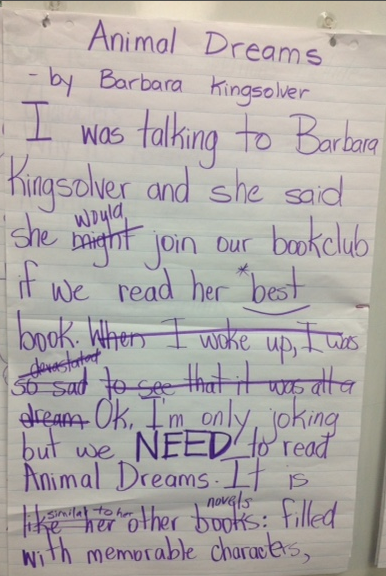 I had many goals in mind as I facilitated the writing, but the main purpose was for the children to see that we can be expert at some seemingly simple, yet oh-so-important things. When writers have a topic or reason for writing that they care about, some choice within that topic, and several clear descriptions of quality...they write. Educational Psychology, Vol. 8(3), pp. 317-344. Routman, R. 2005. Writing Essentials:Raising Expectations and Results while Simplifying Teaching. I have a confession to make. There was a time when the teaching of writing, not to mention the assessment of writing, overwhelmed me. It just seemed so BIG…I didn’t feel I had a handle on it at all. I knew I wanted a workshop approach. I knew that student choice was important to me and that quality literature would be integral to the workshop. Beyond that, I had more questions than answers. The big ideas of assessment for learning helped me figure it out, beginning with identifying the learning destination. I realized that part of why writing felt so huge to me was that I really didn’t know my curriculum well enough. I didn’t know exactly what I wanted my students to know and understand, do, and be able to articulate. Reading the curriculum, in fact poring over it, was not enough. I needed to take it apart and put it back together in ways that made sense to me and served the needs of the students I was teaching. Looking at both the front matter and the specific learning outcomes, I copied all that pertained to writing. I did this electronically, cutting and pasting what I needed into a Word document. Then I printed it and cut out each outcome or statement as a strip. Looking at the charts will tell you that this is still too big to teach from or to communicate clearly to students. I chose one chart as the work of my next term and grouped the outcomes even further so that I could identify the learning destination, both for myself and my students. • Various genres and forms have distinguishing features that appeal to various audiences and at varying times. • Writers write for many purposes, audiences, and genres. Some details of the criteria for quality writing vary depending upon the genre/form and some are constant. • Create original texts with a real audience and purpose to communicate understanding of various forms and techniques. Know: Their strengths and next steps as a writer. Understand: Writers are continually self-assessing and improving their writing, making it better for their reader. Do: Work with various small and large groups to support each other as writers. Now that I know where I am going and what I want my students to learn, I can make this target clear to them. I can think about the kinds of evidence we might collect; the conversations, observations, and products that will show me, and my students, how close they are to the target. Knowing the learning destination also makes it clear to me the kinds of samples my students will need to see, the criteria we will need to co-construct, and the modelling I will need to do. I can see the baseline data I will need to collect, the mini-lessons that will follow, the genres we might study, the conferences we might have, and the discussions we will engage in. But first, I must know the curriculum and make it my own.